BEIRUT — Over several nights in September, some 10,000 men, women and children fled areas under Islamic State control, hurrying through fields in northern Syria and risking fire from government troops to reach a province held by an al-Qaida-linked group. While the U.S.-led coalition and Russian-backed Syrian troops have been focused on driving ISIS from the country’s east, an al-Qaida-linked insurgent coalition known as the Levant Liberation Committee has consolidated its control over Idlib, and may be looking to return to Osama bin Laden’s strategy of attacking the West. Syrian activists with contacts in the area say members of the Levant Liberation Committee vouched for fleeing ISIS fighters they had known before the two groups split four years ago and allowed them to join, while others were sent to jail. The activists spoke on condition of anonymity because they still visit the area and fear reprisals from the jihadis. ISIS has lost nearly all the territory it once controlled in Syria and Iraq, including the northern Iraqi city of Mosul — the largest it ever held — and the northern Syrian city of Raqqa, which once served as its de facto capital. Tens of thousands of its fighters have been killed on the battlefield, but an untold number have escaped. As it gradually disintegrates, theological splits have also emerged within the organization, including the rise of a faction that blames its leader, Abu Bakr al-Baghdadi, for the setbacks. The two groups both sprang from al-Qaida in Iraq, which emerged in the years after the 2003 U.S.-led invasion, but split over ideology and leadership in 2013 and battled each other across northern Syria. Earlier this month, ISIS attacked the Levant Liberation Committee again, in what was seen as a revenge attack after the defections. While ISIS went on to carve out a proto-state in large parts of Syria and Iraq and declared an Islamic caliphate in 2014, the al-Qaida militants allied themselves with other Syrian insurgent groups and cultivated grass-roots support by providing aid and other services to civilians. They remained focused on the war against Syrian President Bashar Assad’s forces, although they’ve also crushed several small U.S.-backed rebel factions. “The honeymoon period for al-Qaida, in which the so-called Islamic State absorbed most of the counterterrorism focus while al-Qaida’s affiliates grew stronger, is coming to an end,” according to an analysis by the Soufan Group security consultancy. “It now appears Zawahiri is seeking to consolidate the terror network and return the group to its heyday as the vanguard of a global movement,” it added. That could place the militants in the crosshairs of the international coalition. Here's a timeline of events in the northern Syrian city of Raqqa, captured by U.S.-backed Syrian forces from the Islamic State group on Tuesday. Turkey launched a limited military operation in Idlib last week aimed at imposing a “de-escalation zone,” one of several set up across Syria under an agreement between Turkey, Iran and Russia. The Turkish troops have yet to confront al-Qaida, but that could change if it comes to be seen as a regional or international threat. Meanwhile, Assad’s forces, fresh from victories against ISIS in eastern Syria, may switch their focus to Idlib, the largest remaining insurgent bastion in the country. 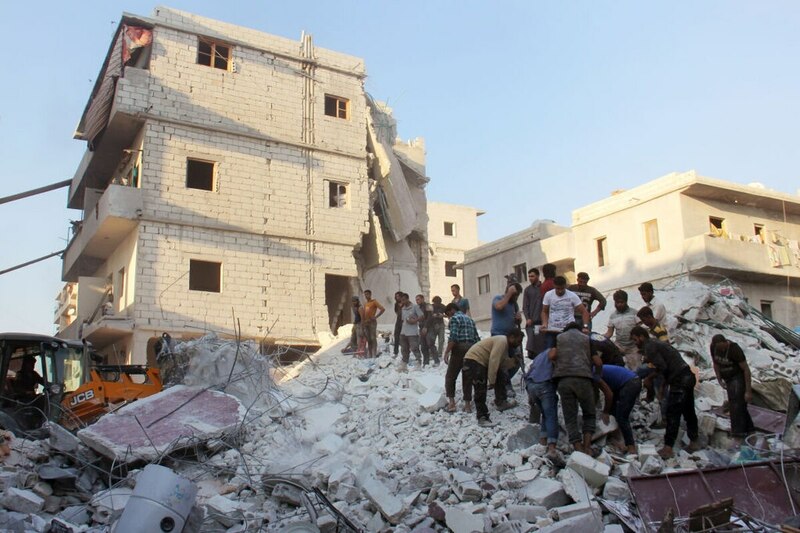 Russia, which has been waging an air campaign in support of Assad since 2015, struck an al-Qaida gathering in Idlib earlier this month, and claimed to have killed several militant commanders.